Walking dogs can be one of the joys of pet ownership, with benefits for both people and dogs. It can increase owner—pet bonding through engagement in an activity together. Unfortunately, too many dog owners are unable to take their dogs for walks due to unwanted behaviors while on a leash, including barking, pulling, jumping, growling, and attempting to bite people and other dogs. Unwanted behaviors during a walk often begin as unruly behavior without ill intent when an exuberant dog tries to reach people and other dogs. These behaviors make walking difficult and, over time, the owner tries to control the dog by tightening the leash and sometimes using either verbal or physical punishment. However, these reactions to the unwanted behavior may signal to the dog that the impending approach of people and other dogs is problematic, increasing rather than decreasing the dog’s emotional arousal. Punishment also increases anxiety and fear, and the stimulus may then become associated with unpleasant outcomes, further increasing tension whenever the dog encounters people and other dogs. Previous adverse events on walks may also be contributory, such as unwanted encounters with people, fights with other dogs, or lack of proper socialization or social skills. At what distance does the response begin? What is the response at that time? For example, does the response begin with alerting behavior and watchfulness or full blown aggressive behavior? How does the response manifest? Encourage the owner to describe the response in detail, including body posture, vocalizations, and ability to control or divert the dog. When is the response at its peak, and where is the person/dog at this time? How does the encounter end, and when, or at what distance, does the dog return to a baseline controllable behavior? Rate the behavior on a numerical scale (1—5, with 1 the lowest response and 5 the highest), if possible (Table 2). This rating is useful to assess treatment response. In most situations, the dog’s responses to stimuli (people/dogs) tend to be a combination of fear-based anxiety and learned responses. In some cases, the dog has poor social communication skills and does not read the social signals of people and/or dogs appropriately. Often, continued encounters increase the dog’s reactivity and vigilance on walks. Play; some, but not all, dogs find play an enticing reward. If a dog does not respond to either of these, then the stimulus is too intense. All dogs have to eat but are not likely to eat or play if they are anxious or frightened. Extremely desirable rewards (“A” treats) are saved only for training and conditioning sessions and are withheld at other times. All situations that cause the behavior to occur must be avoided, especially in the early stages of treatment. When the dog engages in the behavior repeatedly, not only does it learn how to improve the behavior, but also the repetition may bias the synapses, allowing the response to occur faster and earlier each time. If the only way for the dog to eliminate is during a walk, these walks must be arranged at times and places when and where encountering people and/or other dogs is less likely. However, if other people and/or dogs are seen, the owner should increase the distance between the dog and the stimulus. Crossing the street, turning around and walking the other way, or even stepping behind parked cars to block the view of the oncoming stimulus can be utilized. At no time should the owner try to approach other people or dogs, or force any encounters. These steps are not only prudent but can actually diminish anxiety and fear as the dog learns that it will not be exposed to a frightening or anxiety- producing situation. 3. Increasing control and ability to leave potentially aggressive situations. Learning is unlikely to occur when an animal is highly emotionally aroused; therefore, controlling the intensity of the stimulus is absolutely essential. In order to change an emotional behavioral response, one must understand how the response changes with varying characteristics of the stimulus. To grade the response, one needs to know how the pet responds to the stimulus as that stimulus changes either in its proximity, speed of approach, or location, as well as other characteristics, such as sound or size. Only low levels of the stimulus allow the dog to remain calm. Operant counter conditioning is teaching the dog a new response, such as focus or relaxation, that the owner can cue on command. See The Role of Rewards for Classical and Operant Counter Conditioning for further discussion on how to change underlying emotional states during classical counter conditioning. Foundation Exercises Before Training on Walks outlines the baseline training that must be in place prior to conditioning. A task to get, and keep, the pet’s attention (this is operant counter conditioning). Teach the pet to look at the owner using a phrase, such as “watch me” or “focus.” A leash and head collar can be used for additional control. The task is first practiced in neutral, quiet surroundings until well performed, and then distractions can slowly be added; this latter part of training also falls into the category of desensitization. Initially, the dog is rewarded for eye focus and small signs of relaxation by quickly administering the treat. As the dog begins to understand the task, it will show more signs of relaxation and stay relaxed for longer periods of time. As training progresses, treats are given for increased relaxation and intermittently to help solidify the learning. The goal of this step during training is to maintain eye contact with the pet for several minutes, while it remains neutral, calm, and relaxed. A cue and task that allow the owner to leave or end the situation. The dog is taught a phrase, such as “let’s go” or “follow me”; then turned 180 degrees and briskly walked in the other direction. This should be performed quickly, but without anxiety or tension. Initially, food (“A” treats) is used to lure the dog to follow and execute the turn. Again, this is first practiced in a quiet location, allowing a quick and reliable response each and every time. The goal of this step during training is to diminish the dog’s response to a stimulus by increasing the distance between the dog and the stimulus. All of these steps must be in place before classical counter conditioning training on a walk can begin. Again, while this pretraining takes place, the stimuli known to cause the problem behavior must be avoided. The dog should be able to focus, and then leave on command, before an owner begins counter conditioning. Some owners may need additional help with a force free trainer to master these tasks. It is important for the owner to humanely and properly gain control of his or her pet. Leashes are absolutely necessary (avoid retractable leashes), and the use of harnesses; head collars, such as the Gentle Leader (petsafe.net/gentleleader); and/or comfortable and properly fitted basket muzzles are strongly recommended for dogs that will be in situations in which they encounter people and/or other dogs. The pet should be wearing a flat collar with tags but with a nonretractable leash, attached to a head collar or body harness, held by a responsible adult. Choke collars and chain pinch collars are never recommended; they cause pain and discomfort, which results in the dog forming an aversive association with the situation. Reliable control can be achieved with proper use of head collars and/or body harnesses. If necessary, a consultation with a force free trainer for a proper fitting may be required. Identifying the response gradient (Table 2) is absolutely essential to setting up successful training sessions. The goal is to help the pet learn that the arrival of the stimulus predicts the desired treat and, in the absence of the stimulus, treats are not provided. We want the dog to learn to associate the sight of the stimulus with something pleasant. This is classical counter conditioning. Initial sessions begin with the stimulus at the predetermined distance (from the history) where little or no response is noted (1/5 on response scale), and the highly desired treat readily available. The owner asks the pet to “focus” (look at the owner) and then feeds the treat regardless of what the pet does (it can look at the stimulus as long as the behavior does not progress to lunging or barking). Ideally the dog should focus as requested, but if the dog does not look at the owner, but remains calm (no lunging, barking, pulling, etc), then the reward is the classical part of the conditioning, associating something good with the stimulus, and should be given. As the stimulus comes closer to the predetermined spot where undesirable behavior is going to begin (2/5 on response scale), the owner must quickly but calmly put away the food; then exit the situation using the “let’s go” command. Several repetitions at the same distance are completed before decreasing the space between the owner/dog and the stimulus. In order to progress to the next step (stimulus is closer), the dog must remain calm; if the behavior is escalating as the stimulus approaches, the dog is not learning the proper association and a larger distance is advisable. The time to achieve this varies between dogs so patience is important. Quickly progressing through the distances does not allow the proper learning to occur. The owner must not attempt to stay longer than the dog can remain calm and focused. If the dog becomes reactive, the owner must immediately leave with the dog. The owner must also realize that the training session allowed the stimulus to be too close or too intense, and future sessions must maintain better control of stimulus intensity. Unwanted responses occur when the owner does not have good control over the stimulus; without control of the stimulus, it is unlikely the dog will learn the desired responses due to heightened emotional stimulation. Owners and dogs may need to be quite a distance away from the stimulus to keep the dog calm and controlled. Remember, the dog learns best when calm. Early in training, the owner cannot expect the dog to walk by people/dogs and take treats if the dog is too upset. 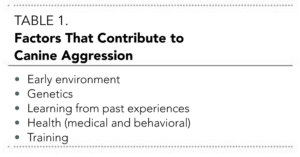 In addition, a key to avoiding reactive behavior is providing an accurate response gradient to use during training (Table 2). This training can occur with people/dogs encountered while walking ONLY if the dog has been pretrained, and the distance can be controlled by leaving or widening the distance between the dog and the stimulus. Each session should end on a positive response. If the dog does extremely well in a given training session, end the session immediately with a big reward to mark the good behavior. This treatment regimen can often help decrease the arousal level, allowing the dog to be controlled during the situation. In some cases, the dog may also become willing to approach people or other dogs, but in others, an acceptable resolution may be that the dog walks calmly but still does not wish to greet any person or dog. In most cases, it is advisable to avoid greeting people or dogs on walks even if the dog is not displaying undesirable behavior. Remember, what you are trying to teach the dog is that it does not need to worry; the stimulus will not get too close. Owners cannot punish away an emotion, such as fear, anxiety, or aggression. When the pet is punished in these situations, it is being punished for the behavior at the time, which can have several unintended consequences. Punishment of outward expressions of the behavior, such as barking, lunging, or growling, may not affect the underlying emotion of fear or anxiety that is causing the outward responses. Punishment can result in a dog that does not signal because, although it learns growling or barking is unwanted, the dog still wants the stimulus to go away. This response can cause what owners describe as unexpected, or unsignaled, biting since the dog no longer displays outward signs of distress (barking, lunging) but uses other signs, such as head turning and backing away, that go unnoticed. In other words, the dog still does not want to be in that situation and tries to make it end. A dog’s fear or anxiety toward a stimulus may actually increase because the dog may associate the punishment with the stimulus rather than its own behavior. 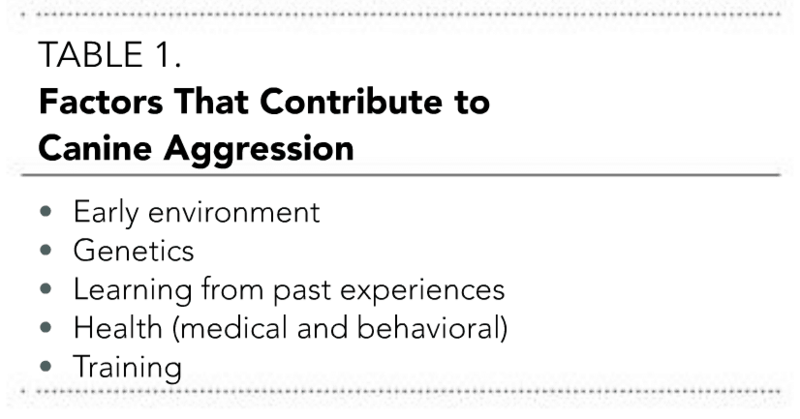 In this scenario, intensity of responses may actually increase rather than decrease as the pet attempts to “force” the stimulus to leave because the stimulus is now associated with a bad thing—punishment. Aggressive behavior by dogs walking on a leash creates tension and welfare issues for the dog and the family. Early exposure to people, places, dogs, and other stimuli may help condition dogs to accept all types of stimuli on walks. When a dog is reactive, the best approach is to remove the dog from the situation and work on slow counter conditioning to help the dog learn the proper responses. Guy NC, Luescher UA, Dohoo SE, et al. A case series of biting dogs: Characteristics of the dogs, their behaviour and their victims. Appl Anim Behav Sci 2001; 74:43-47. Bain M. Aggression toward unfamiliar people and animals. In Horwitz D, Mills D (eds): BSAVA Manual of Canine and Feline Behavioural Medicine, 2nd ed. Gloucester, UK: BSAVA, 2009, pp 211-222. Appleby DL, Bradshaw JWS, Casey RA. Relationship between aggressive and avoidance behaviour by dogs and their experience in the first six months of life. Vet Rec 2002; 150(14):434-438. Horwitz DF, Neilson JC. Blackwell’s 5 Minute Veterinary Clinical Companion: Canine and Feline Behavior. Ames, IA: Blackwell Publishing, 2007, pp 71-78. Debra F. Horwitz, DVM, Diplomate ACVB, is a veterinary behavior consultant in St. Louis, Missouri, and a frequent lecturer on behavioral topics in the U.S. and abroad. She has authored and edited several books and chapters, including her most recent project, Decoding Your Dog, a book for pet owners authored by Diplomates of the American College of Veterinary Behaviorists. Dr. Horwitz is a past president of the ACVB and was voted NAVC 2012 and 2014 Small Animal Speaker of the Year. She received her DVM from Michigan State University.